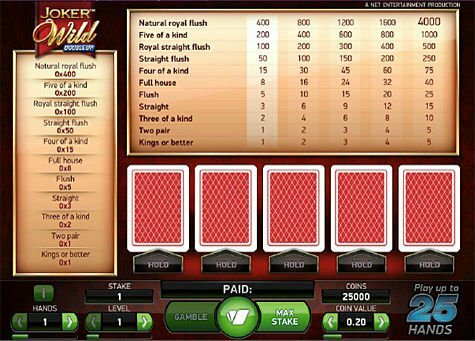 Joker Wild is ideal for first time players, as it is really easy to learn. You can in effect, be playing and winning in just minutes. 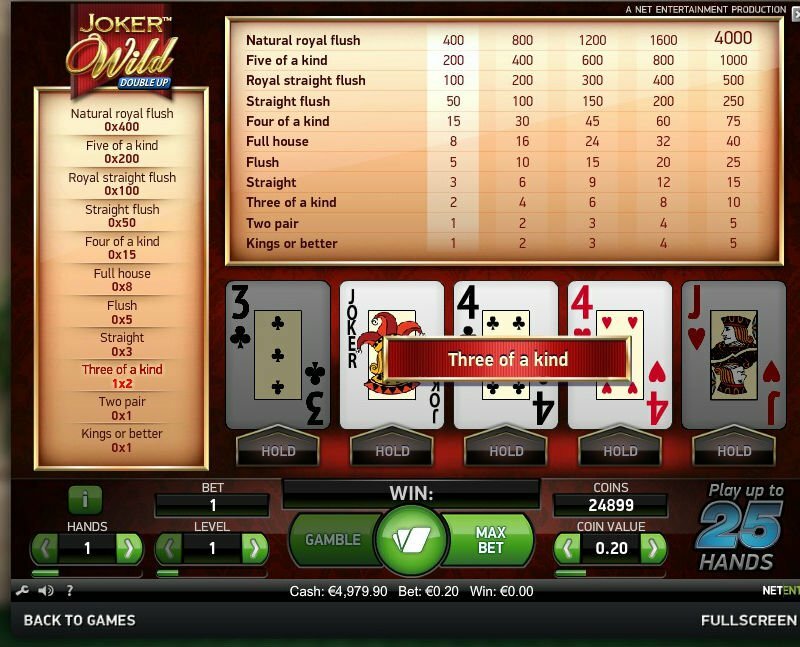 Joker Wild has been developed by NetEnt, as one of their premier as one of their premier video poker games. All of the standard poker hands are there for you to win with, as well as additional hands, which are worth decent pay-outs themselves. Wagering is easy as pie in this poker game. Players can select from a range of coins worth 0.10 up to 10.00, and they can bet up to 5 of those per line. Players can also bet on up to 25 hands at once, if they wish, giving Joker Wild a huge wagering range. Once a bet has been staked, the player will get 5 cards. This forms their first poker hand. Players can trade out as many as 5 cards in this hand, but they can only do this once. All discarded cards will be replaced with new ones, forming a second poker hand. 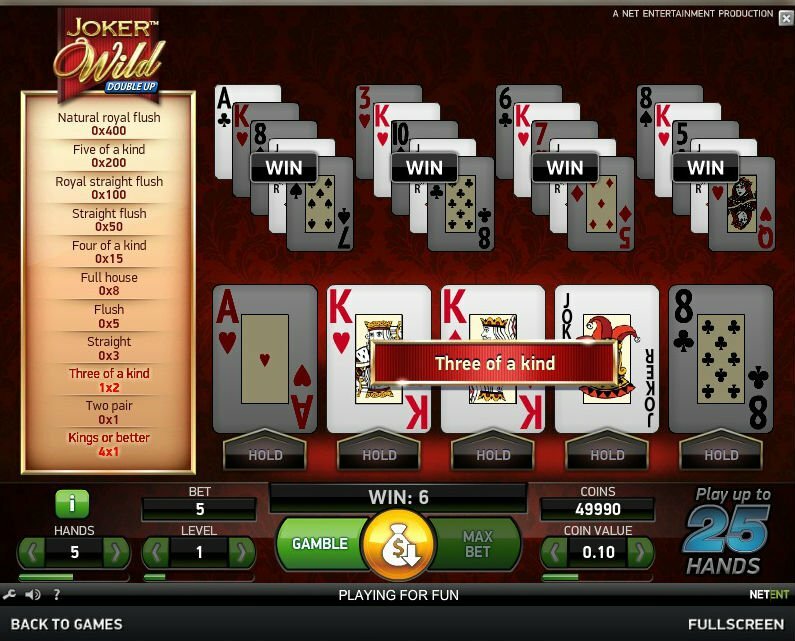 When playing Joker Wild poker online, it is this second hand which you will judged on. Winning hands include Kings or Better, Two Pairs, Three of a Kind, Straights, Flushes, Full Houses, Four of a Kind, Straight Flushes, Royal Straight Flushes, Five of a Kind, and Natural Royal Flushes. If your second poker hand matches one of those on the pay-table to the left of the screen, you will win a respective pay-out from this pay-table, up to a total of 4,000 coins. When it comes to online poker games which contain wilds, normally players will need a Three of a Kind to win anything at all. That isn’t the case in Joker Wild, with just Kings or Better able to bag you a win. Joker Wild is ideal for first time players, as it is really easy to learn. You can in effect, be playing and winning in just minutes.